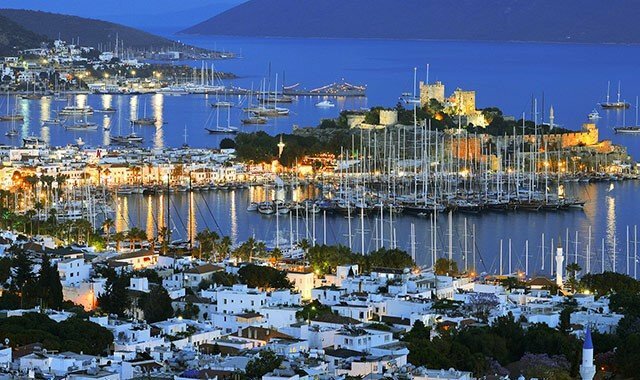 Bodrum is the main city that boasts of many tours. The typical route goes through the Gulf of Gokova, Gulf of Hisaronu and Gulluk before reaching dozens of deserted bays with green forests and moving down to the rocky coastline. This experience becomes priceless when you visit the inland ancient sites of Didyma and Iassos upon anchoring – the background resounding with the sound of goat bells tinkle at a distance. Next destination is Gokova, a little bit different but more lively with its sprawling beaches and seaside resorts. Besides the hustle-bustle in the city of Gokova, there also are remains of the ancient city Keramos with the main attraction being Cleopatra’s beach. Rumors tell us that this beach was imported from Egypt for herself and her lover Anthony! This anecdote makes the destination all the more exotic and exciting. Knidos, located further south-west of Gokova, was a great city during ancient times. In modern times, it is a great destination for all tourists taking a Blue Cruise trip. There is a string of private beaches and deserted caves where you can enjoy swimming, snorkeling and other water sports in sky blue waters. If you like fishing, you can easily find a fishing spot and whatever you catch will be your dinner for the night with a promised BBQ by our chef! Datca is your next destination and one of world’s three cleanest having zero industrialization. With its unique and clean atmosphere, charming restaurants, bars and craft shops, Datca is like a dream town where you can simply walk around, buy souvenirs for the family or friends back home or pick up something to remind yourself of your exotic Blue Cruise adventure. 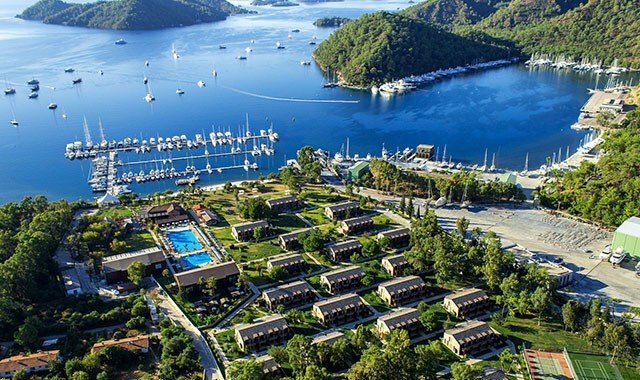 The popular resort of Marmaris is located beyond the Gulf of Hisaronu. 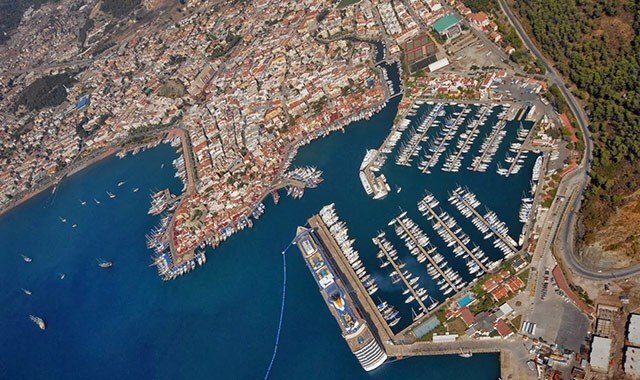 Marmaris is the home to some of the largest hotels as well as marines in the Aegean. Iztuzu is along the coast where you can find the Loggerhead Turtle, or in other words, Caretta-Caretta shells. You can enjoy the river on small boats and visit Dalyan, where all famous ruins of Caunos are located. Besides, you can also experience pampering mud baths and enjoy the hot springs. Next on the list is Fethiye. It is a very large town. Its port is one of the most active ones in the region. Fethiye involves many bays and islands. 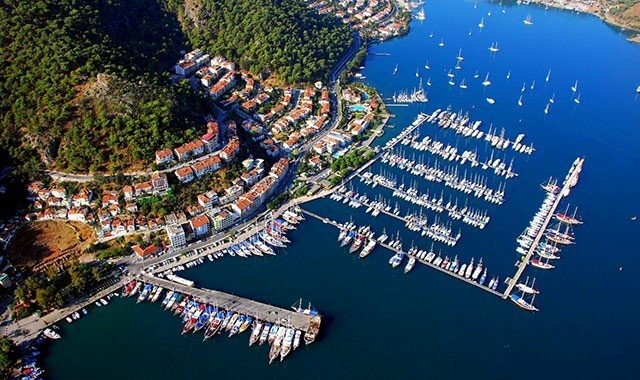 On your route you will also get to stop by at Gocek, another quiet and intimate town in the Gulf of Fethiye. Here you can see the most exquisite yachts in the harbor. Olu Deniz (Dead Sea) lies on the South of Fethiye. Here, you can see the amazing blue lagoon and nature reserve. You will also get to explore the Lycian ruins of Xanthos and Letoon. Kalkan and Kas are a couple of small but famous towns on the east of Fethiye. The exotic atmosphere in these towns especially comes from its cobblestone roads, elegant shops, exquisite restaurants and bars. Next on your itinerary is Kekova, where there is a sunken city. The grand Ottoman Castle located in this area will give you the taste of the magnificence of the Ottoman Empire. Antalya is the last stop and one of the largest and the most popular resorts in Turkey. The old town of Antalya faces the harbor, where the narrow roads interlink with each other and take you to the restaurants, bars and shops. The Hadrians Gate, located on the main road, can be seen outside the old quarter.